Senate Majority Leader Mitch McConnell is perplexed, with no idea what President Trump thinks he was gaining. In fact, McConnell rather doubts the president has a strategy, a close source tells Axios. House Speaker Paul Ryan is furious, according to a person very close to him. Both felt blindsided by Trump's stunning decision yesterday to abruptly side with "Chuck and Nancy," as he chummily called the Democratic leaders, in a deal to avert a government shutdown Sept. 30 — at the price of reviving the politically painful issue right before the 2018 elections. Soak this in: It's now possible that Trump's biggest legislative wins this year will be more spending and raising the debt cap — the exact opposite of what Tea Party Republicans came to D.C. to do. Trump "brazenly rolled his own party's leaders," as AP put it. Plus his own Treasury secretary, Steve Mnuchin — in front of leaders of both parties. Why it matters: Tax reform is now less likely, with trust ruptured between Trump and Republican Hill leaders. Democrats are more likely to flip the House in 2018: Republicans have less than ever to show their voters. A Democratic source tells us: "[T]he sequence was GOP pushing for 18-month debt [limit increase], then 12, then 6, then Trump cutting them off and agreeing with us on 3. ... The Oval Office spins fast in Trump's White House." The details, per the N.Y. Times lead story: "The agreement would avert a fiscal showdown later this month without the bloody, partisan battle that many had anticipated by combining a debt ceiling increase and stopgap spending measure with relief aid to Texas and other areas devastated by Hurricane Harvey. But without addressing the fundamental underlying issues, it set up the prospect for an even bigger clash at the end of the year." 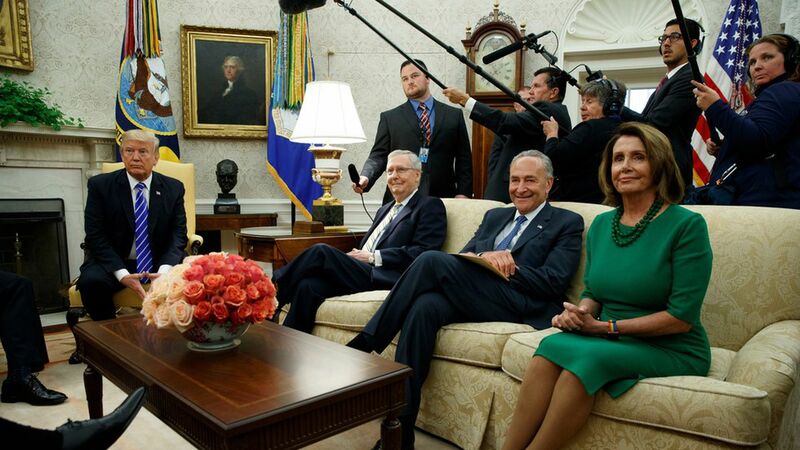 In an Oval Office meeting that went over an hour, Republicans and Democrats in the room argued their competing cases: Rs for a longer debt ceiling extension and Ds for a three-month stopgap. Ivanka Trump memorably dropped by to make her case to Senate Democratic Leader Chuck Schumer and House Democratic Leader Nancy Pelosi for her child tax credit plan. Schumer, who has known Trump since the president's New York days, made his pitch. After they'd been round and round, Trump said they had a deal — and shook hands with Schumer! Be smart: This was a seminal moment for Republican congressional leaders. They left the Oval having watched the titular leader of their party side with Dems, right in front of them. They watched their carefully laid plans — using Harvey funding as leverage to push through a long-term debt ceiling extension — blow up in their faces. The hostility that Republicans on the Hill feel towards Trump deepened. One senior GOP official, summing up the day: "He f----d us." A prominent Midwest GOP operative emails me: "Democrats got more done in a single Oval Office visit in one afternoon than the congressional Republicans have achieved all year."